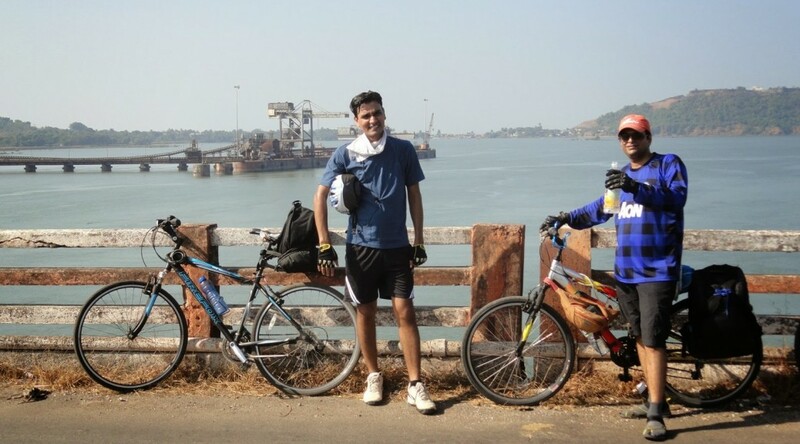 The first day – From Madve to Alibag we covered almost 20km in an hour. This made us very optimistic of our distance covering abilities.. only that this route didn’t have any ghats. After पोहा at Alibag, we moved on towards Kashid, which had a ghat just before Kashid beach invited us with its beauty. Our first ghat of the ride and it took our breaths out ! we relaxed for almost an hour at Kashid beach on hammocks sipping coconut water. Murud wasn’t far away, we reached by lunch time had a lunch on the sea-side hotel overlooking the bright beach ahead of us. Our original stop was at Murud but since we were this early at our destination, we thought we should move on further, Diveagar. The ferry at Rajapuri made us wait for almost an hour. This hour though was well spent, interacting with the individuals, checking the routes, ferry rides, etc. It was here that we got to know that a ferry exists down south of Harihareshwar at Bagmandla to Bankot (Thank god, it exists! Else we would’ve required another 100km+ to reach Velas beach side). We commenced our 2’nd ferry of our ride, Rajapuri, Murud to Dighi. The road from Dighi was bad, period. It didn’t improve till we climbed the first ghat just next to the Dighi jetty, came down when it improved.. Diveagar was there almost by the setting sun, evening in its prime. We looked for room to stay, and day 1 was done. Hi – I am new to riding. Done just about 200km on my new bike. But I hope to do Mumbai – Goa in Jan 2019. Could use some tips as regards training etc. Plus if any group doing this i would like to join them. As of now it’s just me alone. Nice to hear u want to do Mumbai – Goa. Training – As long as u are generally healthy and regular on cycling, trekking, running or swimming that is more than sufficient. I’m not sure about these groups, best is if u find your friend, or else nothing like a solo ride all alone with ur senses, road and your cycle!